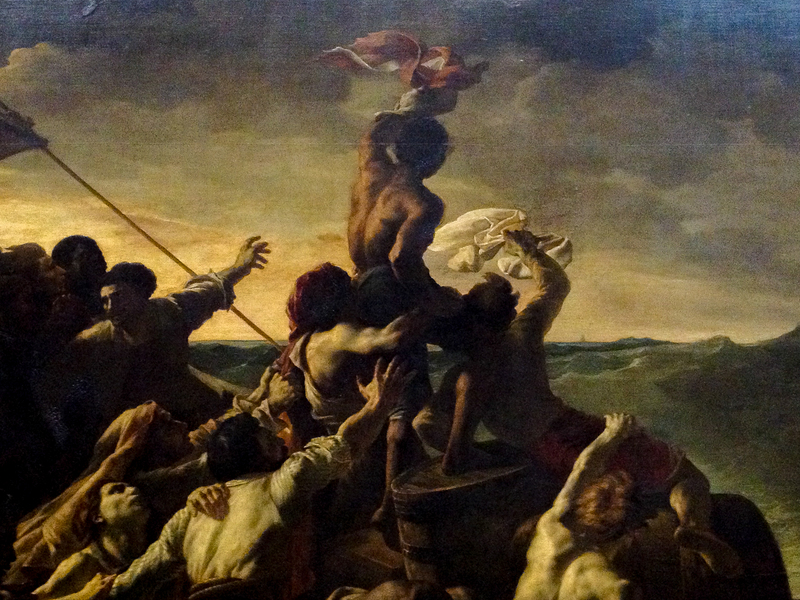 Théodore Géricault, The Raft of the Medusa (1818-19). Paris, Musée du Louvre. Today the O Antiphons begin. Part of the Church’s Advent prayer for at least12 centuries, they employ seven images from the prophet Isaiah to engage us with the names and attributes of the Holy One whose coming (‘Advent’) we await. Originally sung before and after the Magnifcat at Vespers, I find them to be a marvelous way to pray during these final days before Christmas. There is one antiphon for each day from December 17 to December 23. Copy them on seven slips of paper, and put each day’s antiphon on a mirror, refrigerator, dashboard, screen or bedpost. Carry it with you during the day. Pray it at dawn, noon, sunset and night, in the midst of activity and the midst of quiet, in solitude and in the company of others. O is such an evocative word. We use it when we come upon something outside ourselves, often unexpected; something that engages us face to face. There is also the O of understanding, or recognition: O, now I see, now I get it. Or even: O, it’s you! And then there is the ecstatic O, expressing delight, wonder, the sigh of surrender: Ohhhhhhhh! You can find both the original Latin texts and English translations online. The best known paraphrase of the Antiphons is the hymn, “O come, O come, Emmanuel.” The following are my own variations. Use whatever version suits you best, or write your own. (Dec. 17) O Sophia, you are the truth of harmonious form, the pattern of existence, the shapeliness of love. Come: illumine us, enable us, empower us to live in your Wisdom, your Torah, your Way. (Dec. 18) O Adonai, ruler of time and history, manifestation of divine purpose to your chosen people, may your presence be our burning bush. Come: bring justice to the poor, food to the hungry, shelter to the homeless, protection to the vulnerable, freedom to the prisoner. (Dec. 19) O Root of Jesse, coming to flower in Jesus, who in turn bears fruit in all who are grafted into the royal line of God’s family. Come: let us never be severed from the roots and branches that nourish us in every moment. (Dec. 20) O Key of David, you open, and none can shut; you shut, and none can open. Come: lead us out of the prisons that oppress body, mind and soul; welcome us into the open space of possibility; let us breathe again. (Dec. 21) O Rising Dawn, bright splendor of the light eternal, illumining all things with Love’s radiance. Come: enlighten those who sit in darkness, who dwell in the shadow of death. (Dec. 22) O Desire of all nations and peoples, you are the strong force that draws us toward you, the pattern which choreographs creation to Love’s bright music. Come: teach us the steps that we may dance with you. (Dec. 23) O Emmanuel, you show us the face of divinity; you reveal the fullness of our humanity. Come: enable us to become who we are. This entry was posted in Anglican spirituality, Episcopal Church, Liturgical Year, Prayer and tagged Advent home worship, centering prayer in Advent, Christian prayer mantras for Advent, meaning of Advent, O antiphons, O clavis David translation, O come O come Emmanuel, O Emmanuel translation, O Oriens translation, O radix Jesse translation, O sapientia translation, prayer and meditation in Advent, prayers for Advent season by jimfriedrich. Bookmark the permalink. These are wonderful, thank you, Jim! I will post them to our church’s Facebook page and give you credit, if that’s all right. Yes, of course. The more sharing the better. Thanks for reading. I didn’t know of these before — although i love Advent, the first time i noticed these prayers was at a wonderful Advent Procession of Lessons & Carols that i drove down to attend at St. James on Wilshire (“St James in the City). I love that service, but don’t recall ever having these O Antiphons included before. Thank you so much for this introduction and your translations. I meant your “variations”, really — which are beautiful.